Easy to make cocoa brownies packed with flaked coconut and chopped chocolate. Rich, dense and chewy, these coconut brownies are topped with coconut ice-cream and Hershey’s Chocolate Syrup for the ultimate brownie sundae! My husband and I have different opinions about food. I’m all for trying new things while he is all about the classics. It may have something to do with the fact that I didn’t grow up here in the States and don’t have childhood favorite treats like he has. Nevertheless, I’m a girl who gets bored with the same dish made over and over again. I’m always looking for new recipes, new ways to put a twist on an old one. Most of the time we compromise. Especially when we have guests over like we did this past weekend. I take something that he loves, like a sundae, find something I know he enjoys (coconut) and combine the two – this is how this irresistible coconut brownie sundae became our after dinner treat Sunday night. There’s nothing quite like a brownie sundae to finish a delicious meal! Who can resist a dense, chewy brownie topped with ice-cream and a rich, chocolatey sauce? There are so many things that come together to make these coconut brownies absolutely irresistible. First, each brownie is baked in a cupcake pan. You know what that means, don’t you? Each brownie has its own chewy edges! Score! Second, the inside of the brownies are packed with coconut flakes and chopped chocolate. Yes, you can use chocolate chips but I highly recommend using baking chocolate. Most chocolate chips will keep their shape while baking, but chopped baking chocolate will be oozing in every bite. Double win! Third, making your brownies from scratch may require just slightly more effort than making brownies from a box but they are worth the effort! 10-15 minutes of prep time and one bowl to clean. That’s all! Once you have your brownies baked and cooled, it’s time to get down to business. Ice-cream and chocolate sauce! What sundae is complete without a big scoop of ice-cream and a fantastic sauce? Since the brownies were packed with coconut goodness, we settled for coconut ice-cream, but you can use vanilla or chocolate. Finish the sundae with a classic. Hershey’s chocolate syrup! If my husband is willing to compromise with other dishes, he’s untouchable when it comes to drenching ice-cream in chocolate sauce. It has to be Hershey’s! It’s a classic! Sundae are definitely a summer favorite treat! They are so easy to make and everyone loves them! This summer, we should all celebrate #SundaySundae with lots of coconut brownies topped with a scoop of ice-cream and finish it with Hershey’s chocolate Syrup! I think it will be the best summer ever! Easy to make cocoa brownies packed with flaked coconut and chopped chocolate. Rich, dense and chewy, these coconut brownies are topped with coconut ice-cream and chocolate syrup for the ultimate brownie sundae! Heat the oven to 350F. Grease 2 cupcake pans and set aside. In a mixing bowl, add butter and sugar. With the paddle attachment on, beat on low speed until the butter is light and fluffy. Add coconut extract followed by the eggs, one at a time, beating well after each addition. Combine flour and cocoa; gradually beat into creamed mixture just until blended. Fold in the chopped baking chocolate. With a large ice-cream scoop, divide the brownie batter between the 18 cups. Bake in preheated oven for 20-22 minutes or until a toothpick inserted near the center comes out with moist crumbs (do not overbake). Remove from the oven, cool in the pan for 15-20 minutes before inverting the pan and finish cooling the brownies on a wire rack. Just before serving the sundaes, top each brownie with a scoop of ice-cream and drizzle Hershey's chocolate syrup over it. I always love me a good brownie sundae. These are super cute and I am sure super delicious. 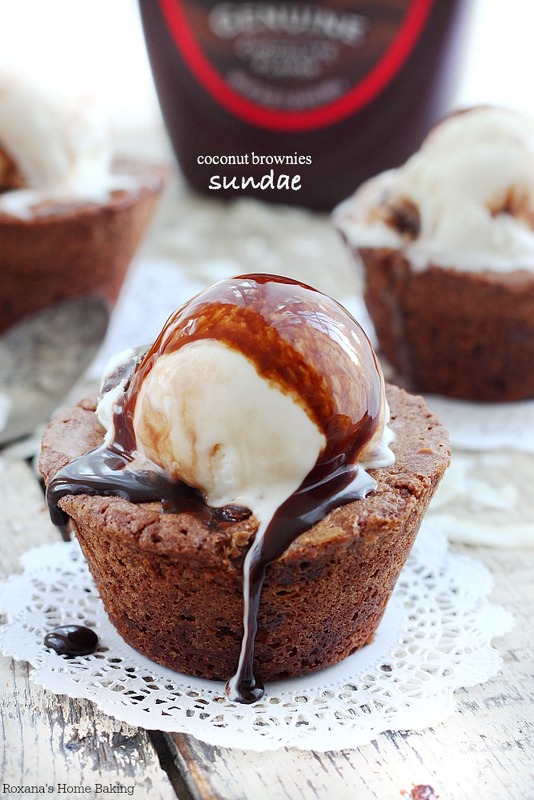 These brownie sundaes look so delicious and perfect for summer. These look fantastic! I have to change up recipes, too, or I will get bored. If my husband likes a certain meal, he will eat it for days! We always have Hershey's syrup in the fridge too. My family would love these brownie sundaes. 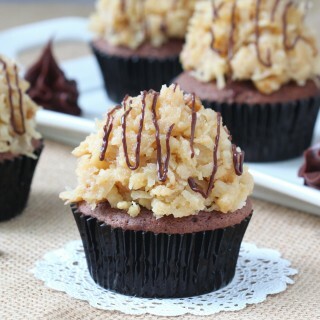 These look decadent and delicious! All the chocolate! Yum. My husband and I are the same way! My husband will order a club sandwich at EVERY restaurant we go to and I cannot order the same thing twice. These look amazing! 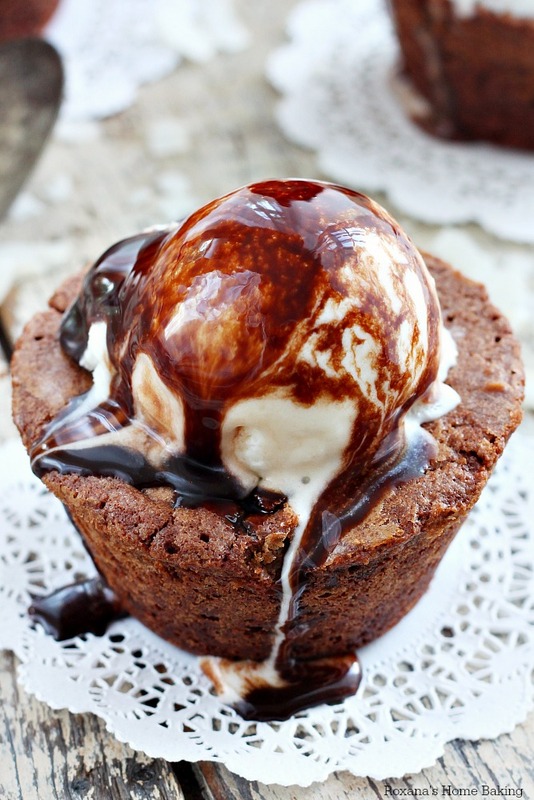 Brownie sundaes are my favorite! That is one PERFECT Sundae if you ask me, all chocolaty and delicious and Hershey's syrup is a must have! Love the idea of adding coconut to brownies. The ice cream and Hershey's syrup are a big, fat bonus! Oh my goodness, my better half and I are the same way. I'm a little more adventurous when it comes to food. ;) These brownies though...I'm pretty sure both of us would go crazy for them! Pinned! 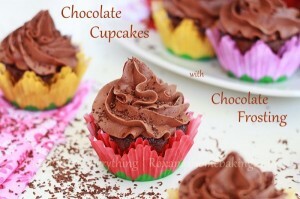 These look incredible -- I LOVE coconut and chocolate together! Pinned! Roxana this looks like the best thing ever right now! And I agree - it always MUST be Hershey's syrup! I would say both my husband and I are adventurous eaters but we definitely both have our favorites and have a tendency to fall back onto them quite often! And brownies are a fav of ours. I can just see the fudgy middle and I am already craving one! OMGoodness - I would love this right now! 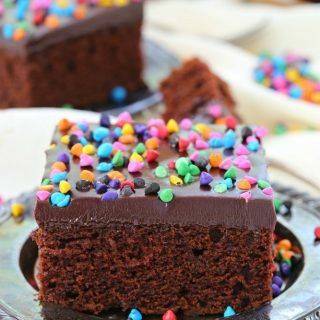 It looks so chocolatety and delicious! Hi Alida, Coconut extract can be found at most grocery store that sell any kind of spices and extracts. If you don't have any, you can use vanilla extract. Looks so so good! Just irresistible! Oh, man, you got me with the coconut! What a dreamy dessert! I LOVE these, Roxanna! This may be my new favorite dessert, and I haven't even tried it yet. This looks great, chocolate and coconut are irresistible combination, I just pin this magnificent brownies... I still think that the ice cream of coconut best choice! These look epic! 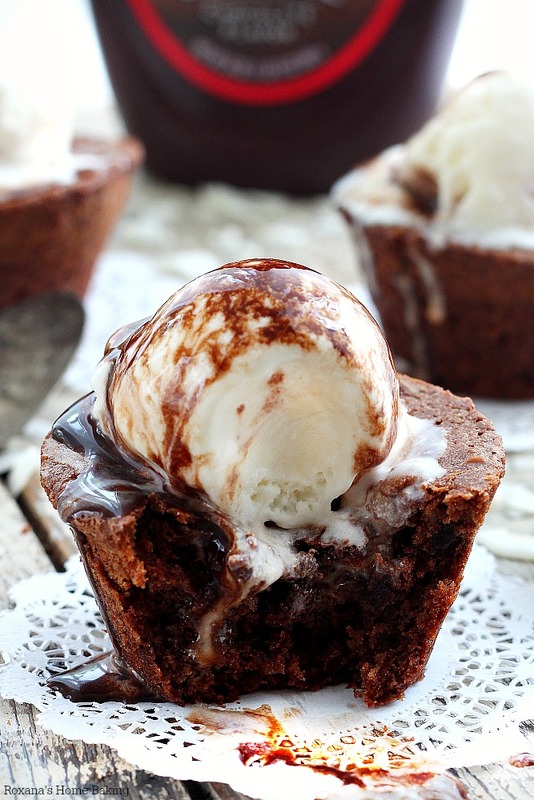 Love everything from the brownie cups to the ice cream and chocolate drizzle! I don't think you can get any better than coconut, brownie sundaes, and of course Hershey's chocolate! Now this is my kinda sundae! LOVE this combo of comfort and innovation!! so coconutty and chocolatey and perfect!